Peter Belles Irvine was born in 1823 in Kentucky. He married Minerva Angelia Tabor, daughter of Rev. Isaac Tabor and Susannah Bullock, on 23 November 1847 in Montgomery County, Texas, and Peter's brother Benjamin married Minerva's sister Catherine. Peter Belles Irvine and Minerva Angelia Tabor appeared in the US federal census of 1 June 1850 in Montgomery County, Texas, living next to Peter's brother Benjamin.. Other members of the household included Isaac F. Irvine. He was a mechanic, according to the 1850 census. Peter Belles Irvine and Minerva Angelia Tabor appeared in the US federal census of 1 June 1860 in Montgomery County, Texas. Other members of the household included Isaac F. Irvine, J. Irvine, Elizabeth Catherine Irvine and Henry Reid Irvine. Absent from the household in the enumeration are younger children William Fielding and Peter Belles Jr. He was a mechanic, according to the 1860 census. Green Wood recorded: 1861, Jan. 30th, Paid P. B. Irwin my Account up to date $35.75." He served as a private in Company B, 24th Regiment, Texas Cavalry, under Captain Samuel Dunbar Wooldridge's command. 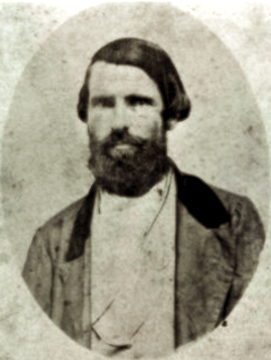 Peter Belles Irvine died on 11 January 1863 in Arkansas County, Arkansas, at Fort Hindman during the Battle of Arkansas Post. His wife Minerva Angelia Tabor became a widow at his death. He was interred on the battlefield, with a memorial marker at the old Danville cemetery, Montgomery County, Texas. For an account of his CSA service in Company B, 24th Texas Cavalry Regiment, see his profile in Karen McCann Hett's Danville Mounted Riflemen.